The Saptarishi (seven great sages) (from Sanskrit: सप्तर्षी (saptarshi), a Sanskrit dvigu meaning "seven sages") are the seven rishis in ancient India, who are extolled at many places in the Vedas and Jivan literature. The Vedic Samhitas never enumerate these rishis by name, though later Vedic texts such as the Brahmanas and Upanisads do so. They are regarded in the Vedas as the patriarchs of the Vedic religion. The earliest list of the Seven Rishis is given by Jaiminiya Brahmana 2.218-221: Agastya, Atri, Bhardwaja, Gautam, Jamadagni, Vashistha and Vishvamitra followed by Brihadaranyaka Upanisad 2.2.6 with a slightly different list: Gautama and Bharadvaja, Vishvamitra and Jamadagni, Vashistha and Kashyapa and Atri, Bhrigu. The late Gopatha Brahmana 1.2.8 has Vashistha, Vishvamitra, Jamadagni, Gautama, Bharadvaja, Gungu, Agastya, Bhrigu and Kashyapa. In post-Vedic texts, different lists appear; some of these rishis were recognized as the 'mind-born sons' (Sanskrit: मनस पुत्र, manasputra) of Brahma, the representation of the Supreme Being as Creator. Other representations are Mahesh or Shiva as the Destroyer and Vishnu as the Preserver. Since these seven rishis were also among the primary seven rishis, who were considered to be the ancestors of the Gotras of Brahmins, the birth of these rishis was mythicized. In ancient Indian astronomy, the constellation of the Big Dipper (Ursa Major) is called saptarishi, with the seven stars representing seven rishis, namely "Vashistha", "Marichi", "Pulastya", "Pulaha", "Atri", "Angiras" and "Kratu". There is another star slightly visible within it, known as "Arundhati". Arundhati is the wife of Vashistha. Vashishtha and Arundhati together form the Mizar double. As per legend, the seven Rishis in the next Manvantara will be Diptimat, Galava, Parashurama, Kripa, Drauni or Ashwatthama, Vyasa and Rishyasringa. Saptarishis are the hierarchy working under the guidance of the highest creative intelligence, Paramatma. The present batch of the Saptarishis are Kashyapa, Atri, Vasistha, Vishvamitra, Gautama Maharishi, Jamadagni and Bharadvaja. They bring down to the earth the required knowledge and energies to strengthen the processes of transition (pralaya). They are naturally the most evolved 'light beings' in the creation and the guardians of the divine laws. In post-Vedic religion, Manvantara is the astronomical time within a Kalpa (aeon), a "day (day only) of Brahma", like the present Śveta Vārāha Kalpa, where again 14 Manvantaras add up to create one Kalpa. Each Manvantara is ruled by a specific Manu. Apart from the omnipotent supreme almighty-Vishnu & next in line to brahma's place-Vayu; other deities such as ChaturmukhBrahma(present Brahma whose age is currently around 51 years) and Rudra, Garuda, Shesha, Indra's cycle would have completed and they would have been united with the Omnipotent supreme entity - Brahman(Vishnu). 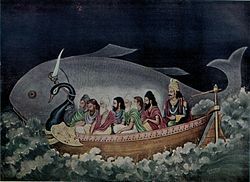 Later on, Vayu ascends the throne of Brahma and the process of creation thus begins again after the mahapralaya(great destruction of the universe), Rishis and their sons are born anew in each new Manvantara according to the Vishnu Purana. Manvantara in Hindu units of time measurement, on a logarithmic scale. Swayambhu Marichi, Atri, Angiras, Pulaha, Kratu, Pulastya, and Vasishtha. Vasishta is accompanied by his wife, the faint companion star Arundhati (Alcor/80 Ursa Majoris). The valid avatar's clan will be named after Ashvamedh. At the end of every four ages there is a disappearance of the Vedas and it is the province of the seven Rishis to come down upon earth from heaven to give them currency again. In Jainism it is stated that, "Once at Mathura situated in Uttar Pradesh Seven Riddhidhari Digamber saints having 'Aakaashgamini Vidhya' came during the rainy season for chaturmaas whose names were 1.) Surmanyu, 2.) Shrimanyu, 3.) Shrinichay, 4.) Sarvasundar, 5.) Jayvaan, 6.) Vinaylaala and 7.) Jaymitra. They all were sons of King Shri Nandan of Prabhapurnagar and queen Dharini. Shri Nandan king took diksha becoming shishya of Omniscient Pritinkar Muniraaj and attained salvation. Because of great tapcharan of these seven digamber munis the 'Mahamaari' disease stopped its evil effect and they all gained the name as 'Saptrishi'. Many idols of these seven munis were made after that event by King Shatrughna in all four directions of the city." ^ Shankar, P.N (1 January 1985). A guide to the night sky (PDF). Bangalore: Karnataka Rajya Vignana Parishat. ^ Wilson, Horace Hayman; trans. (1840) "Vishńu Puráńa", Sacred-Texts.com. Contains an account of the several Manus and Manwantaras.